Early voting for the 2019 City Council Election begins on Monday, April 22 and runs through April 30. Election Day is Saturday, May 4. Kerrville United has always tried to encourage a higher turnout for local elections. Last year we made some progress, but overall voter turnout for citywide elections is still embarrassingly low! Studies have shown that when you actually make a specific plan to vote, you are more likely to follow through and cast a ballot. Also, if you make plans with friends, you’re even more likely to follow through because those friends hold you accountable. So today we invite you to make a specific plan with your friends on when you’ll vote, who you’ll vote with, and where you’ll take a selfie after you finish! First, take a look at the calendar below and determine when you might be able to vote. This year all early voting takes place only on weekdays, so if you work an 8-5 job, you might want to look at the first two days, when polls are open early and late. The majority of early voting, polls are only open 8-5. Talk to a friend or a co-worker and encourage them to go and vote with you. If any of your family members or friends need transportation, volunteer to drive them. The more people you personally contact and make plans to vote with, the higher the turnout will be. Kerrville really needs higher turnout — especially among younger voters! Set that voting date as you would with any important appointment, and honor it! Plan on voting early so that if something unexpected happens, like a flat tire, or a sick child, you’ll still have time to reschedule. Vote during the early voting dates or election day and take a selfie with the hashtag #VoteForKerrville and we’ll feature you on our social media pages and in a live video webcast on Election Day! Upload the photos to Facebook, Instagram, or Twitter on or before election day! All voting takes place at the Cailloux Theater on Main Street in downtown Kerrville. This entry was posted in City Council, City of Kerrville, Elections, Kerrville and tagged election on April 17, 2019 by Aaron Yates. Yesterday the Kerrville Board of Realtors announced their endorsements of two candidates for city council: Gary Cochrane and Kim Clarkson. This is only the second time in recent memory that this board has endorsed specific candidates. The first was in the 2018 race when the board endorsed Judy Eychner and Bill Blackburn. Board members of the Kerrville Board of Realtors with Gary Cochrane and Kim Clarkson. Photo from Facebook. The Kerrville Board of Realtors is a group that represents over 250 real estate professionals in the Kerrville area, promoting private property rights and home ownership. 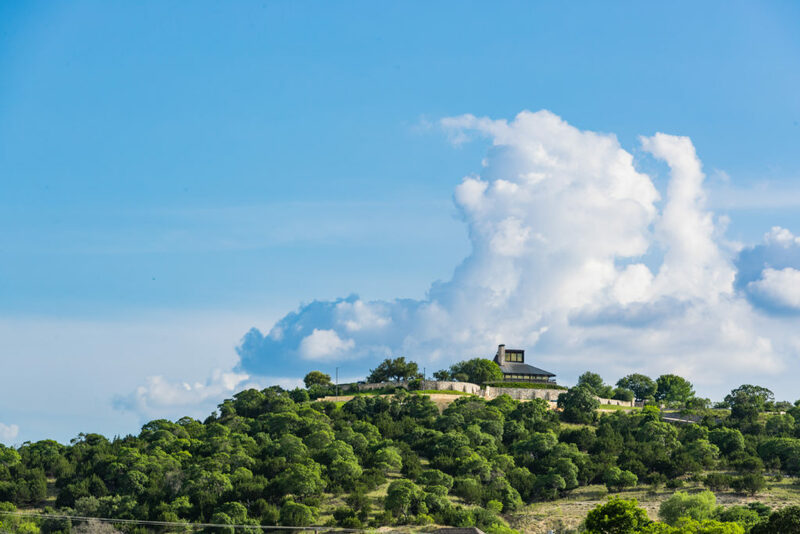 The board and its membership has a vested interest in seeing Kerrville continue to grow responsibly and continue to be an attractive place to live and work. Early voting begins on Monday, April 22, and Election Day is May 4. Kerrville will elect two places to City Council — Place 1 and 2. This entry was posted in City Council, City of Kerrville, Elections, Kerrville, News and tagged city council, election, endorsement, realtors on April 17, 2019 by Aaron Yates. 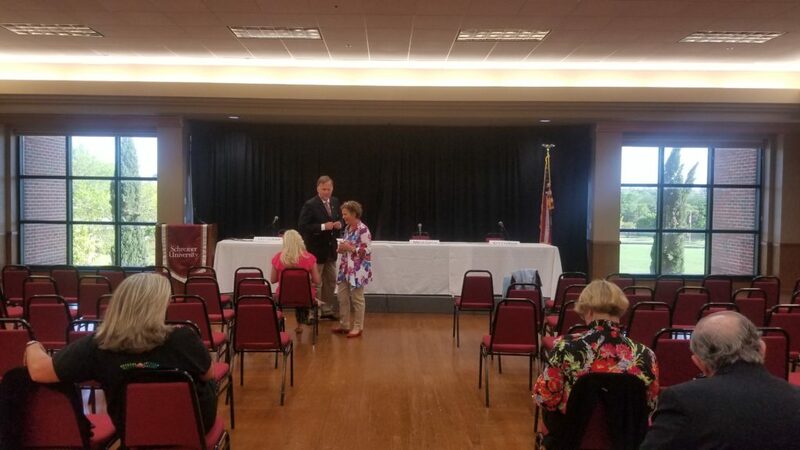 We will be live-blogging the Kerrville Area Chamber of Commerce candidate forum at Schreiner University beginning at 6:00 PM. 5:45 PM – Candidates and community members are gathering and visiting ahead of the forum, which is scheduled to begin at 6:00 PM. Chairs are set for approximately 200 spectators on the second floor of the student activity center. Behind the candidates’ stage, the easterly view looks over the front entrance toward Highway 27. 5:55 PM – The five-minute warning has been announced and all four candidates are in their seats on the stage. From left to right, there’s the moderator’s podium, then Gary Cochrane, George Baroody, Mario Garcia, and Kim Clarkson. Tonight’s moderator is Walt Koenig, executive director of the Kerrville Area Chamber of Commerce. The crowd is taking their seats and it’s a near-capacity crowd. Rules/Format: Each candidate will give a three minute opening statement. There is a timekeeper in the front row. Series of questions to follow — some from Walt and some from the audience. The audience is invited to write questions on note cards and hand them in during the event. Each question must be answered in one minute. At the end, each candidate will give a two-minute closing statement. The order of the seating has been assigned randomly, and the order of the statements is also random. Kim Clarkson goes first. She goes to the podium for her opening statement… She was born and raised in Kerrville, came back to Kerrville after college, and taught at Starkey Elementary. Seven years later she joined her family’s business, and decided to go to work for various nonprofit organizations in Kerrville including CWJC, Habitat, Blue Santa, etc. She was asked to be on various boards such as KPSF, Chamber, Executive Women’s Club, United Way, and more. She has honed her leadership skills at these organizations and her family business. She was involved in local government via the Kerrville 2050 Plan, governmental affairs committee chair at Chamber. She has developed the necessary skills to do this job, and her heart is with this community. She has proved this with her actions, not just her words. Gary Cochrane goes second… After thanking the chamber and the audience, he starts by saying he’s not a public speaker or a politician. He loves the community and has come to realize that we have some issues on city council that need resolution. It’s his turn to step up and make a change. We all want good roads, water, safety, etc., and have different means of getting there. This election isn’t as much about issues as it is about the people getting elected. Certain traits are important: integrity, moral standards, vision, communication, listening, trust. Trust has been violated on current council. Issues are important, but this election is about the people. George Baroody is third. He stands at podium… He’s 51 and has lived in Kerrville 17 years. He’s an umpire. He defines the job of council as an advocate for the people. Convey the wishes of the people to the staff and the public. The vision that each has involves where they’re coming from and where they’re going. He isn’t trying to take the city somewhere. He’s continuing the traditions of Kerrville. He isn’t satisfied with the current trends going on in city government: spending is going up, debt is up, household values are up 25%, all while population is going up, and personal income is going up only 6%. The gap between income and expense is a problem. Must come to table with ideas to resolve the problem. Need accountability with our economic development. Shouldn’t be subsidizing businesses. Should invest in workers, not just businesses. Mario Garcia goes fourth from the podium… Everything everyone just said is true. He grew up in Kerrville and he’s running to make his mom and kids proud. He’s also doing it for all of the seniors and elders in the community that raised him. He has old and traditional values. Who are these individuals running for council? He’s a Navy vet, carried top secret clearance working on nuclear weapons. Was a stay-at-home dad for a time. Started a business in Austin and brought it back to Kerrville. Wanted a sense of community for his family and children. He has been running Kerr PC for 14 years in Kerrville. He’s been hustling, working, volunteering as a coach, CMJC, and elsewhere. He comes from traditional values, has a different belief about spending (not a club to damage ourselves). He’s proud of where he comes from. Question 1: What is your vision for the future of Kerrville? Cochrane: His vision is not as important as the citizens’ vision. Citizens created 2050 plan, and council should honor that. Wants Kerrville to continue to grow responsibly. Can’t stand in the way of progress. He’s a big advocate for quality of life programs. His vision is to continue both of those trends. Baroody: Keep looking forward with an eye on the past. He’d like to see Kerrville keep its identity. Growth is coming, and it must be sustainable. Need opportunities for all; not just a few. That’s his biggest factor. The people need a voice. No Kerrvillian left behind. Everyone counts equally, and policies should be equitable. Garcia: His vision wants to be “shared.” We don’t have enough community input; need more. He has a lot of respect for past. One foot in the past, one in the future. Growth is coming. Everyone is talking about sustainable growth, but we shouldn’t inject it. It should be natural growth. Let’s have more community input and put citizens first. Clarkson: Reads from mission statement of Kerrville 2050. “Kerrville will be a vibrant and inclusive community…” This is our statement, the vision from Kerrville 2050. Every decision should be based on a look to the vision and a look to the future. Question 2: If elected, what would your top three priorities be? Garcia: Radical openness… we need to share ideas. Radical transparency means that everything needs to be open. Last is citizens. Need more citizen participation. He’s going to have monthly meetings for citizens. Clarkson: First is civility. We are not able to effectively communicate if we can’t listen. Without listening, we can’t grow. Second, basic infrastructure and housing needs. Third, grow and diversity the economy. Bring in jobs with good wages so that all can enjoy quality of life. Lastly, quality of life. What made you want to move here? We enjoy the river trail and other thing and our future depends on quality of life so that it’s a place people want to come. Cochrane: Our council is broken and it needs to be fixed. Second, economic growth. We have to come at it from all angles for sustainable and safe growth. If not growing, we’re dying. Lastly, housing. He doesn’t have the solution today, but we have to lay the groundwork for a solution. Baroody hasn’t put forth any ideas in his two years, but Cochrane has ideas, and he’s ready to get to work. Question 3: What is the city’s role in terms of helping the current housing deficit? Clarkson: The city is not a builder or a developer. What can the city do? Provide a space that is attractive to builders and developers, such as city property on Loop 534. City can build infrastructure and send requests to developers to bring ideas and solutions. 2050 plan has told us that we need to diversify housing. Must play our part to encourage the kind of housing that community needs. Cochrane: There is no easy solution. Must look at increasing density through some potential zoning changes. The city should extend services such as water and sewer to encourage development. Must begin planning for water/sewer. City isn’t in development business and city shouldn’t incentive developers. “If you build it, they will come.” Builders want to make money, so if it’s attractive to do so, they’ll come and build. Baroody: The city isn’t a builder or developer, but we can incentivize. First, need incomes to the point where they can afford housing, and needs jobs that pay well. If Cochrane was paying attention, he’d note that projects have been proposed, but they’ve stalled, and Baroody doesn’t know why. We’ve been trying, but it hasn’t been followed through on. Question 4: If elected, how do you see the dynamics of council working? And community engagement? Clarkson: Citizen engagement is critical to success of city. We do not need to dictate the decisions for the future of our city. Those decisions come from citizens. We can continue to push out the information, ask questions. If we can’t communicate effectively, we can’t govern. Need a diversity of opinion, and need to be able to move forward after a decision has been made. Cochrane: The council is a team, but doesn’t mean they always agree. Needs respect. You discuss, communicate, decide, and move forward. If I don’t agree and I lose a vote, that’s ok, we’ll move forward. Not going to keep going back to subjects from two years ago. For community engagement, he wants to reach out and hear what people have to say. The door is open to the citizens. Baroody: The ability to have dissenting discourse and keep that civil. Right now, dissenting views are shut down. That’s wrong. You have to have the discussion. If we can’t find a way to disagree, then that’s the fault of the entire council. Just watch the last city council meeting and see how I just accepted a lot of heated comments. Garcia: When citizens are more involved, you get the personalities out. I’m not everybody’s cup of tea. I enjoy dissenting opinions, because it’s necessary. Put it on the ballot. Put big things on ballot such as big projects, long-term debts. This is your city. Question 5: What is the city’s role in economic development? Baroody: City should be in the business of setting up framework to be equal and fair. Every business has advance knowledge of risks, etc., not just “knowing somebody.” Need standards and benchmarks from our economic development strategies. We need to know what to expect from council and city. Shouldn’t use public funds in a speculative way. Garcia: The city has to be involved, but he’s not big on incentives. He won’t say “never,” but wants checks and balances. Need to analyze and show a return on investment. Everywhere else, we need to show a return, but not in government. Must be very careful when we invest in economic development. Clarkson: The 2050 plan says that economic development is important. We have a starting place with the comprehensive plan. Must provide infrastructure that encourages development. Need quality of life projects to attract businesses. The EIC funds are designated for these things, and we must use that money for infrastructure in support of economic development, and for quality of life projects. We must continue to use that funding source. Question 6: How do you see your role in fulfilling the objectives of the 2050 plan? Baroody: I want to change the title of the plan to “Our voice, our city.” Council must cheerlead for the plan but constantly review it. What needs to be tweaked? It is an evolving document. Just because it’s in the plan, doesn’t mean we have to do it. Always paying attention to what’s in the plan, but looking to better it. Garcia: It’s a living document, not permanent. Need to have at least five years to review it before implementing it. Is it applicable to the direction we’re going? Is it future proof? We need to make sure that the citizens are involved. Need to review the document as we go. It is necessary for us to have it, to have a vision, but it needs to be reviewed. Clarkson: We have a council-manager form of government. We hear the goals from the community, set the priority, and implement that vision. We can revise it if we hear something different, but we look at the plan and see what was identified as priorities, and we set the strategies to make them happen. Cochrane: The citizens put this plan together. It belongs to the citizens, not to the council. It’s a roadmap, a goal, and that’s what the comprehensive plan is. We can reach the goals in many different ways, evaluate the plan on a regular basis, and receive citizen input along the way. Question 7: Actions to develop tourist industry? Garcia: Tourism has always been here, ie summer camps. We have never had a problem with tourism. It’s already here. We have a sufficient amount of tourists. We don’t want to be like anybody else. We can’t forget who we are. We have everything we need, we should enjoy the tourists, and we need to spend our money to take care of the residents, not the tourists. Clarkson: We should look at building a convention center. We can attract more professional groups that come here, spend money, leave behind their tax dollars, and use those monies locally to reinvest into local community. Bring people in, then send them home, and it’s a win-win. Cochrane: Kerrville is very attractive to tourists. We have a sense of community and environment. We need to continue to develop the river trail system as a tourist attraction and also the urban trail. We need to look at supporting downtown revitalization. Vibrant downtown is a tourist draw. Baroody: Tourism is a secondary topic. We just keep making Kerrville the greatest city we can, and tourists will come. The river is always going to be there and we should enhance the use of it. I support downtown development, but not every mechanism used to support that. The role of the city is not about incentivizing tourism, but to welcome it. Question 8: Give your evaluation of the overall financial status of our city. Clarkson: Looking at the budget was the first thing I did as a candidate. I asked lots of questions. What I conclude is that we have had leaders with vision to create self-imposed debt limits to keep us from getting into a bad situation. We have a AA bond rating, clean audit, debt limits… We can sustain ourselves because we have ways prove to ourselves that we’re on track. Cochrane: I have a degree in finance and have been in business, but I’m not a financial expert. I surround myself with experts, and I trust and verify with them. We have independent analysts that tell us that we’re in good shape. We have a professional city staff. Yes, we’re in good financial shape. I find it interesting that some of the other candidates don’t want to compare our city to certain other cities, but they will when it comes to debt. Baroody: The financial situation is strong. We have a AA rating. We’re not going to default on debt. The taxpayier position is more important. Our median household income went down while our debt went up. We need to focus on that. We need to address any future debt this way. Garcia: We’ve been increasing debt. Must look at the graph from a distance. Kim brought up the convention center. The comptroller has a report that convention centers are saturated and small towns shouldn’t do convention centers because it’s a waste. This is the difference of ideas. That’s one idea, and we’ll go into debt, and it will be a vacant building with no one using it. Question 9: What priorities would you put on spending discretionary money to advance objectives of the city? Cochrane: The city has to spend money. We have to provide the services to the community. I’m fiscally conservative. Can we use debt for capital projects? Yes. We can’t improve our infrastructure without using debt. Baroody: Prioritizing spending is very important and we don’t spend enough time on it. Since 2011 our priorities are off-track. We focused on “wants” instead of infrastructure. We haven’t addressed infrastructure. We’ve borrowed money to spend on attractions, and we can’t borrow for other things. We should sit down and prioritize our entire budget. Garcia: Spending happens all the time, but I’m not a proponent of going into debt. We have spent on nice things but don’t have the money to spend on other things. All debt spending is affecting future spending. We have to be very careful how we use debt. Let’s focus on primary services. Take care of infrastructure first. Clarkson: I never said that we need to spend money on a convention center. I said that we can grow the tourism industry that way. I am conservative. I have one mortgage which will be paid off in five years, but I couldn’t have bought a home without debt. We cannot do big projects without taking on debt. We have to see the big picture. Question 10: How do we make Kerrville attractive to all age groups? Baroody: Until we have good jobs, we can’t retain our young folks. If we can’t get jobs with those salaries that can support a family, they won’t stay. The solution is complicated, but jobs will retain the young people, and we should focus on that. Garcia: The Kerrville Youth Advisory Council could benefit from mentors. We should embrace them. Very few people are in their meetings. We need to educate them. When they get older, we need a workforce that’s inviting to them. I left and many others have left, too. I’d love for them to stay here. Clarkson: We start by listening. We have the Kerrville Youth Advisory Committee. We need listening opportunities. In the future, what makes them come back? They need a job, an affordable home, and a reason to want to come back here. Cochrane: When I was on EIC, we brought Fox Tank to Kerrville, and they provided education for welders, and that’s been successful. We can do more things like that. They must be able to make a living wage. My son graduated from Tivy and was fortunate to find a job, but most struggle to come back here. So it comes to jobs. People want to be here, but they have to make a living. The candidates receive another round of applause. The closing statements are in reverse order from the opening statements. Two minutes each. Garcia: Tonight was a comparison/contrast. I won on Wheel of Fortune. Before I received the money, I decided to use it wisely. The difference between us is that I’m someone who wants to spend your money to get a return. It’s easy to spend money and have no expectations. I got $40,000 from Wheel of Fortune, and I’ve turned it into more than that. I’m not a big spender. This is your money, and I need all of your input. Debt was a tool for me. Baroody: This open discourse is rare but valuable. We’re all qualified in different ways. My qualifications are a willingness and desire to not just serve a portion, but to serve all of the community and provide the information that isn’t being provided anywhere else. All can enjoy and use that information. The issue that’s important to me is household incomes. The median household income and the number of students on subsidized meals shows that our economy isn’t as strong as we’d like to believe. We have income inequality. We have to address that. The workers that are needed here can’t afford to live here. Cochrane: I’m up here applying for a job. The job is Place 1 City Council. You have two resumes. Hopefully mine looks pretty good. When you hire somebody, you look at experience, similar service, leadership, work with others, vision, communication, and more. It is about the messenger and the message. We need to treat others with respect. My record speaks to financial responsibility. I have the qualifications and I hope you’ll consider voting for me. Clarkson: I want to be part of the journey. This is a marathon, not a sprint. You have to see the future and see a solution and get there step by step. That’s the challenge that city council has to look at — long-range perspective. I have shown you my heart through my service. I’ve shown you my leadership through my service in organizations. I want my kids and grandkids to come back to a vibrant community. I want to work with you to accomplish goals to lead us into the future. 7:28 PM – Koenig encourages everyone to turn out to vote and increase the rate of turnout in this election. Call neighbors and friends to turn out the voters. Thanks to Schreiner University for providing this venue free of charge. Thanks to Chamber Board. Goodbyes. The candidates depart the stage with applause. This entry was posted in City Council, City of Kerrville, Elections, Kerrville, News and tagged chamber of commerce, city council, city of kerrville, election, forum on April 15, 2019 by Aaron Yates. 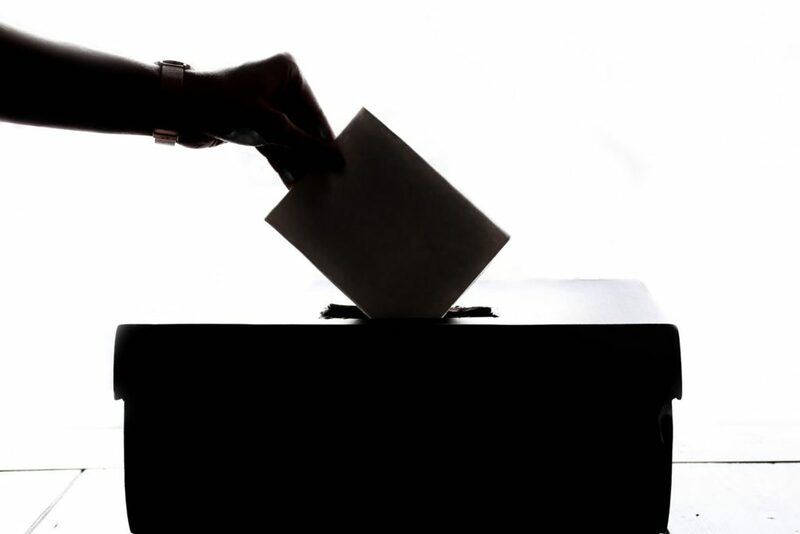 The Kerrville Area Chamber of Commerce will host the final public forum of this year’s election calendar on Monday, April 15, at 6:00 PM at Schreiner University Student Activities Center. All four candidates will participate, including Place 1 candidates Gary Cochrane and George Baroody, and Place 2 candidates Kim Clarkson and Mario Garcia. The forum is open to the public. The Chamber has indicated that the forum will be filmed by Schreiner University and the recording will be made available for public viewing. 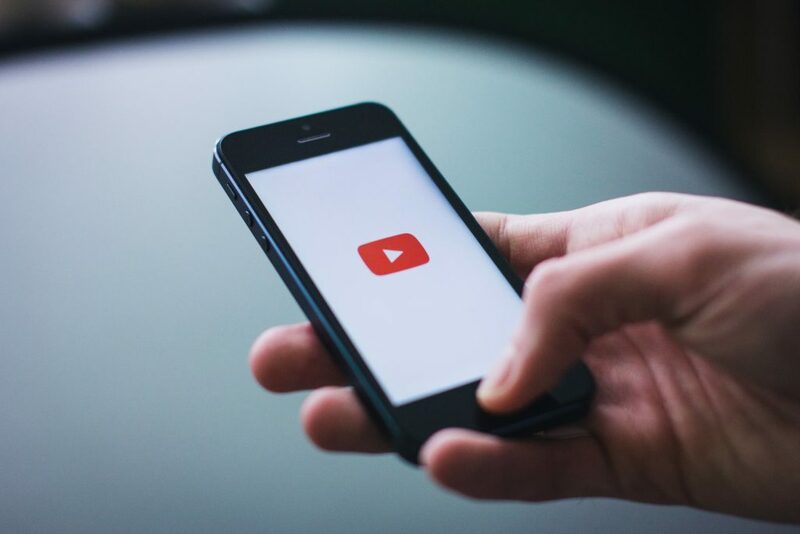 We’ll bring you the link just as soon as it’s available. Early voting begins one week after the forum, on April 22, and runs through April 30. Election Day is Saturday, May 4. This entry was posted in City Council, City of Kerrville, Elections, Kerrville, News and tagged city council, city of kerrville, election, forum on April 14, 2019 by Aaron Yates. The Kerrville Area Chamber of Commerce has confirmed to Kerrville United that the candidate forum they’re hosting on April 15 will be filmed and made available for public viewing. We are so pleased that the Chamber has taken this extra step to help inform the community about their choices for the upcoming citywide election. We encourage all voters to attend the forum, but if you cannot make it, we will publish the video when it becomes available. Early voting begins on April 22 and Election Day is May 4. This entry was posted in City Council, City of Kerrville, Elections, Kerrville, News and tagged chamber of commerce, city council, election, forum, kerrville on April 9, 2019 by Aaron Yates. When last week’s campaign finance reports were published in the newspaper along with a list of all the donors to each campaign, T. Beck Gipson did a double take. He thought he was the only “Thomas Gipson” in Kerr County, but the article listed a Thomas Gipson as a donor to George Baroody’s campaign in the amount of $100. The entry shown on Baroody’s report indeed listed “Thomas Gipson” of 118 Bent Oak Lane as a $100 donor. See an excerpt of the report below, and find the full report here. Excerpt of Baroody’s campaign finance report dated April 4, 2019. But T. Beck Gipson insists that he has never donated to Mr. Baroody’s campaign, and that he no longer resides at 118 Bent Oak Lane, having sold that property and moved to a new home in November. According to Gipson, no one resides at that address at this time because it is undergoing renovation. 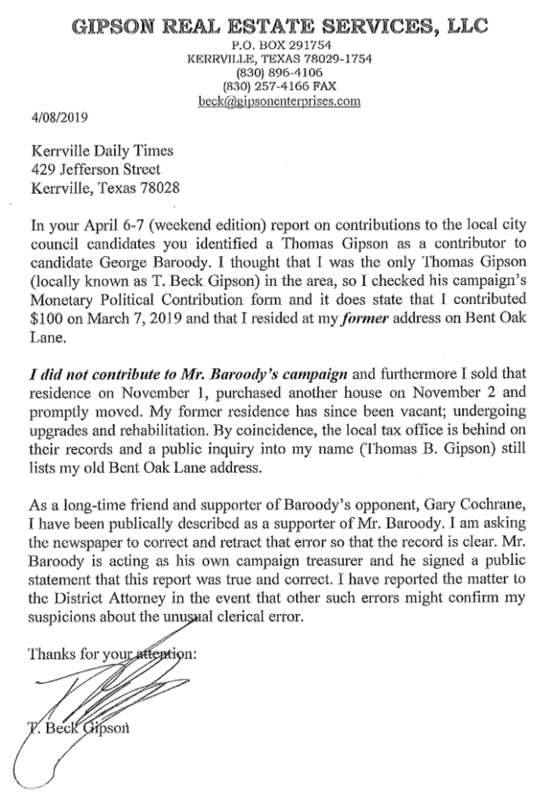 Further, in a letter to the Kerrville Daily Times, Mr. Gipson states that he is a long-time personal friend of Baroody’s opponent, Gary Cochrane. In his letter, Mr. Gipson asks that the newspaper retract and correct the story, and also notes that he has forwarded the matter to the District Attorney for investigation “in the event that other such errors might confirm my suspicions about the unusual clerical error.” The letter is shown below. Fraudulent or false reporting could be a violation of the State Election Code. George Baroody, a candidate for Place 1, acts as his own treasurer. He’s the only candidate to act as his or her own treasurer in this campaign. The report he filed on April 4 includes his signature affirming that, under penalty of perjury, all of the information is true and correct. Baroody claimed to have 18 financial contributors to his campaign — the fewest of all four candidates that filed for this period. Of the four candidates in the race, Baroody collected the least in donations for this reporting period. By March 7, the date listed for Gipson’s contribution, Gipson had not resided at the address listed since November 2018. The Kerrville Daily Times made multiple attempts to contact Baroody by phone and text on Monday but did not receive comment. Could this have simply been a clerical error? Certainly, and we should withhold final judgment until we know all of the facts. It’s certainly curious how something like this could happen on a candidate’s sworn report when that candidate has been scrupulously examining all of the City of Kerrville’s financial records and reports, and plans on making a presentation to the rest of council about the financial condition and debt positions of the city on Tuesday night. Again, at this time there is no evidence that suggests that this report was intentionally falsified or filed fraudulently, and we look forward to Mr. Baroody’s explanation. This article was authored by Aaron Yates, founder of Kerrville United. This entry was posted in City Council, City of Kerrville, Elections, Kerrville, News and tagged baroody, campaign finance report, election on April 9, 2019 by Aaron Yates. Last week we ran an article stating that Garcia was comparing “apples to oranges” in his alarmist advertisement in last weekend’s Kerrville Daily Times. 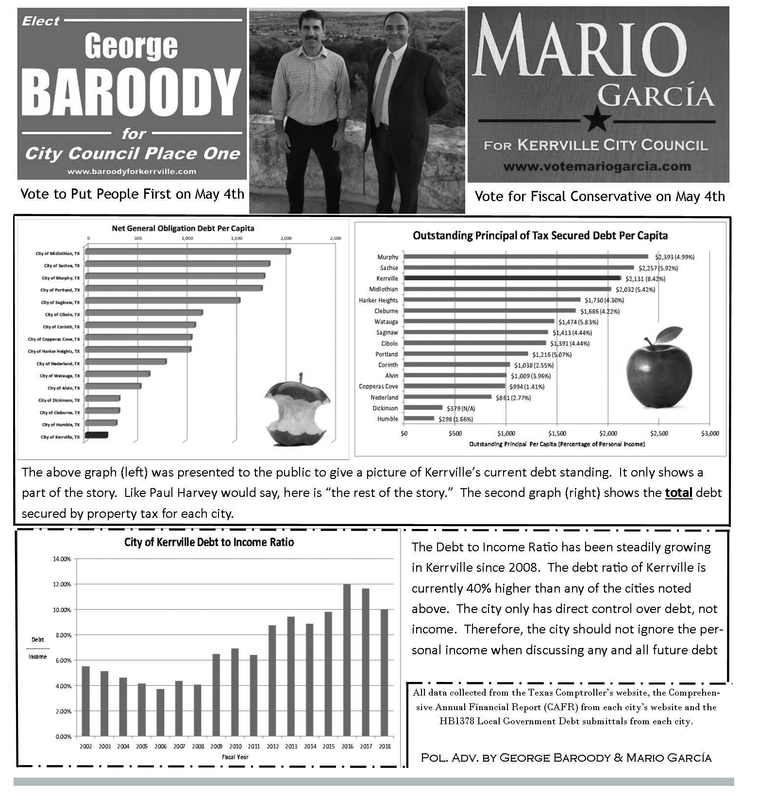 This weekend, Baroody and Garcia have teamed up to take a swipe at Kerrville United by placing apples in their weekly advertisement and have doubled-down on the misleading information they are offering voters. As you’ll recall, the vast majority of Kerrville’s debt is “secured” via ad valorem tax revenues so that we can pay as low of an interest rate as possible. But ad valorem (property) taxes do NOT pay for the vast majority of our debt service. Most of our debt service is paid for by utility revenues and 4B sales tax dollars. However, Baroody and Garcia continue to preach the gospel of fear by comparing Kerrville’s debt levels to cities that have very little in common with Kerrville. The ad also fails to tell voters that the debt, although secured by taxes to minimize our interest payments, is not all paid with tax revenue. Stay tuned for a comprehensive article on this subject later this week. Our article will include ALL of the information along with easy-to-follow citations so that readers can understand the entire picture of the city’s finances rather than the bumper-sticker versions presented each week by Baroody and Garcia. Baroody and Garcia’s joint advertisement in the April 6 edition of the Kerrville Daily Times. This entry was posted in City Council, City of Kerrville, Elections, Kerrville and tagged advertisement, baroody, debt, mario garcia on April 7, 2019 by Aaron Yates. Candidates running for city council must report their contributions and expenses just like most other election campaigns in the United States. For city races, the first report was due on Thursday, April 4, and all four candidates filed on time with the city secretary. 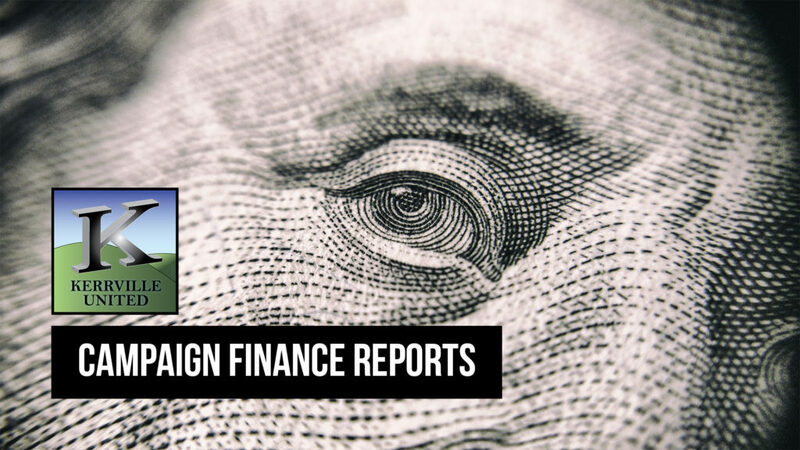 These reports covered the period from January through the end of March. We have obtained copies of each report and have compiled some of the data into readable charts, shown below. One of the key takeaways is this… Campaigns are expensive, and they’re getting more expensive every year. Through the last week in March, the candidates have spent a combined $18,000, and there is still a month to go. One other note before the data… The Kerrville Daily Times reported on the filings, but made an error on at least one critical number: the amount raised by candidate Kim Clarkson. The KDT reported that Kim raised $12,219.01, but in fact, that’s the amount raised by Gary Cochrane. Clarkson actually raised $15,741.51. The candidates raised a combined $36,545 through the last week in March, according to the reports. Around 161 donations were accepted, for an average contribution of $227. Clarkson raised the most money during this period, ringing up $15,741.51 in total political contributions (including in-kind donations). Comparison of contributions raised by City Council candidates through March 25, 2019. A list of individual donors was published in the Kerrville Daily Times article, and those individual donors can also be viewed in the full reports, linked at the bottom of this page. Candidates spent a combined $18k on expenses so far. The bulk of the spending has been on signage and promotional merchandise (about 62%). The remainder is split between printing, newspaper ads, mailings, and other miscellaneous expenses (related to event spending and campaign supplies). A comparison of expenses as reported by each campaign through the end of March. Some of these figures are unremarkable when looked at in a vacuum, but when compared to the spending levels the last time these two places were up for grabs, the numbers are more surprising. In 2017 there was only one contested race, between incumbent Stephen Fine and challenger Vincent Voelkel (Voelkel won). By this filing period in 2017, Voelkel had raised $2,975 while Fine raised $7,623, for a total of $10,598. Compare that with $36,545 raised during the same period this year! Even when compared on an average basis between the number of competitive candidates in the race, the numbers are staggering. See the chart below for the comparison. This chart shows the averages per candidate in 2017 and 2019. As you can see, the average amount raised has increased by 72% and the average expenses have increased 80% from the same race in 2017. Please note that the averages are compared instead of the totals because there was only one competitive race in 2017, while there are two in 2019. Campaigns are more expensive now than ever before. Candidates are raising large sums of money to support their campaigns. Clarkson and Cochrane are leaders in the fundraising contest, and also have the greatest number of individual contributors. Candidates spend most of their money in the first few months on signage and printing costs. We expect the costs to shift more toward newspaper advertising for the next finance period leading up to election day. Don’t forget! Early voting begins on April 22 and Election Day is May 4. All voters that reside within the city limits get to vote for both places. See you at the ballot box! This entry was posted in City Council, City of Kerrville, Elections, Kerrville, News and tagged campaign finance report, city council, election, kerrville on April 6, 2019 by Aaron Yates. 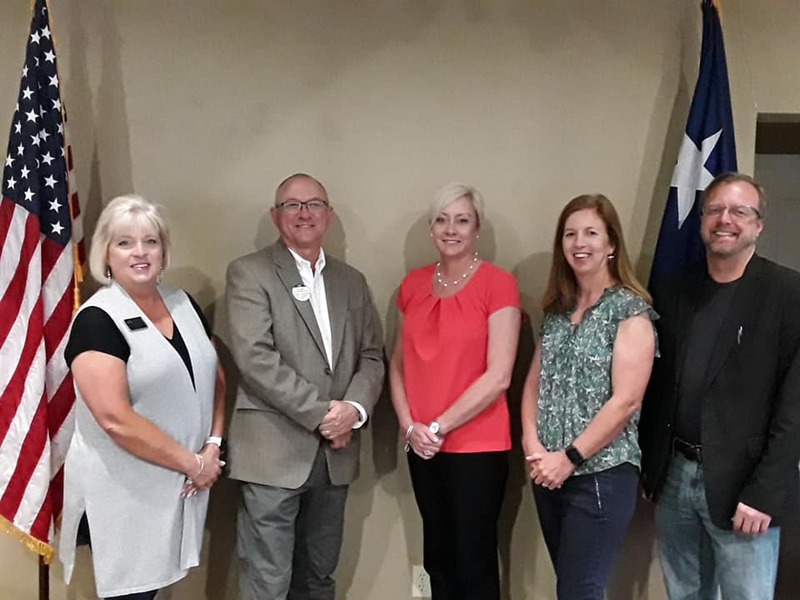 On Thursday afternoon, the four candidates vying for City Council addressed an audience at the Comanche Trace clubhouse in Kerrville. 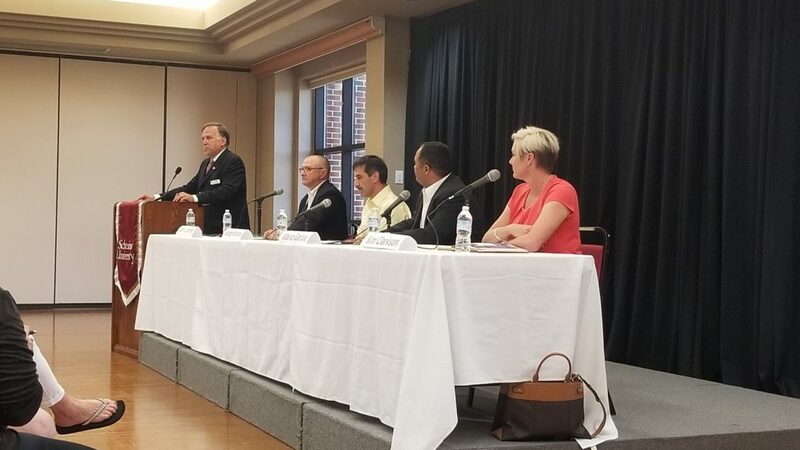 Gary Cochrane, George Baroody, Kim Clarkson, and Mario Garcia participated in the forum organized by the Comanche Trace HOA and moderated by Jennifer Hyde. The forum was not open to the public — only Comanche Trace members and residents were invited to attend. The next forum will be open to the general public, and will be held at the Schreiner University Event Center and hosted by the Kerrville Area Chamber of Commerce. That forum is scheduled for Monday, April 15, at 6:00 PM. The voter registration deadline has passed. Early voting begins on April 22, and Election Day is May 4. This entry was posted in City Council, City of Kerrville, Elections, Kerrville, News and tagged city council, comanche trace, election, kerrville on April 5, 2019 by Aaron Yates. 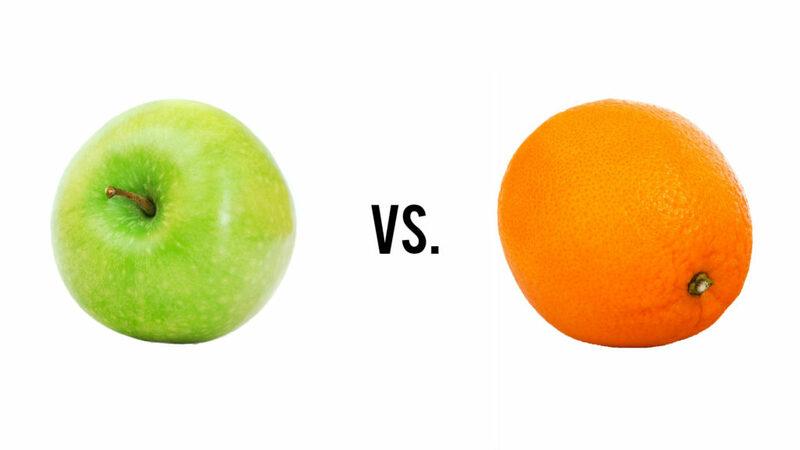 Garcia’s ad features apples to oranges comparisons of Texas cities’ finances. In the weekend edition of the Kerrville Daily Times, published on March 30, city council candidate for Place 2, Mario Garcia, published an alarmist advertisement that characterized the City of Kerrville as a debt-plagued government body that is driving the community over a financial cliff. These claims are misleading, at best. While we are used to half-truths from national political figures, we hope that our local politicians can stay “above the fray” and give the citizens honest and complete information. Unfortunately that is not the case with this ad. According to a recent (unscientific) poll conducted on the Kerrville United Facebook page, approximately 2/3 of our readers HAVE seen city council political ads in one of the local newspapers, so we feel it is important to fact-check these ads, provide context, and give additional resources to voters to peruse on their own. An obligor rated ‘AA’ has very strong capacity to meet its financial commitments. 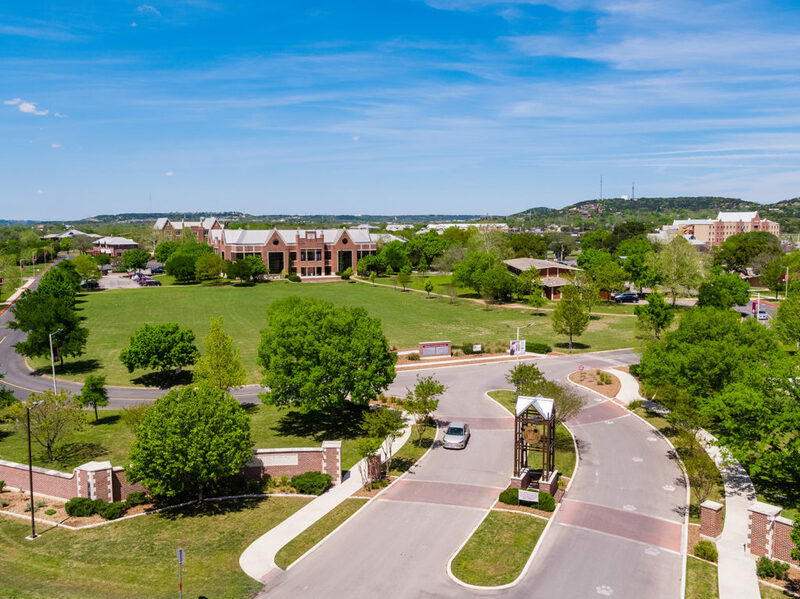 Contrary to what Mr. Garica concludes in his advertisement, S&P considers Kerrville’s financial situation to be strong and healthy when considering all of the factors that they examine, including creditworthiness and capacity to meet financial commitments. We examined the city’s finances in detail in our 2017 white paper entitled, “Financial Review of the City of Kerrville.” While the specific numbers have changed a little, the overall concepts have not, and that paper is a great primer to read before we go further. The advertisement in the Kerrville Daily Times, which was paid for by Mario Garcia’s political campaign, also endorses George Baroody as a candidate for Place 1. The full ad is printed below. Click the image to see it full-size. At the top, Mr. Garcia presents a table titled, “How Kerrville Compares.” In this table, he compares Kerrville to nine other cities of similar populations and gives their “Tax Supported Outstanding Debt,” “Tax Supported Debt Outstanding Per Capita,” and “Population.” However, the numbers don’t add up! The per capita debt should be found by taking the total debt and dividing it by the population. But when you do that, you get different numbers than what Mr. Garcia has presented. See the figure below. In red are Mr. Garcia’s numbers, and in green are the numbers as calculated using his figures for total debt and population. Garcia’s claims are in red, but actual computed figures are shown in green. FOOTNOTE: It appears that Mr. Garcia took these numbers directly from the State Comptroller website without checking to see if the math was correct. For an advertisement that appears to question the competence of government, he seems to put a great deal of faith in the numbers provided to him for this message. Even if we put aside the fact that the numbers don’t compute, we can also immediately see that these nine other cities look nothing like Kerrville. For one, many of the cities have experienced much less growth than Kerrville has experienced since 2010. In fact, several of the cities including Paris, Corsicana, and Marshall have seen NEGATIVE population grown since 2010. We would expect that cities that are shrinking or growing more slowly than Kerrville would be incurring less debt to finance expansions of utilities, services, or public works. But cities that are growing, such as Kerrville, which has experienced 4.6% population growth since 2010, should be financing expansions of municipal services to keep pace with that growth — one element of responsible growth! Comparing population growth of ten cities since 2010. When placing these nine Texas cities on a map, one will immediately notice that none of the cities are anywhere near Kerrville geographically, and further, most of the other cities are very close in proximity to a major urban center such as Dallas, Fort Worth, San Antonio, and Harlingen. 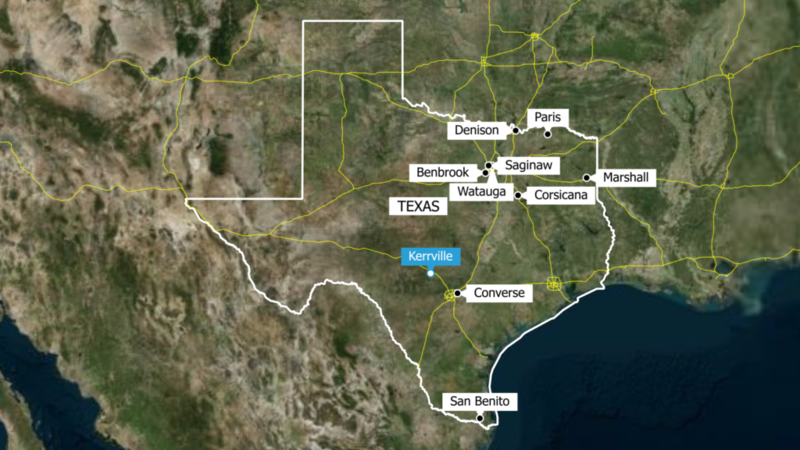 Meanwhile, Kerrville is geographically isolated out here in the Texas hill country, with no major urban centers to rely upon for major infrastructure such as water, sewer, and roads. We are on our own to provide all of the services we need locally, which includes expensive infrastructure costs for things like a sewer plant, water plant, electrical service, roads, bridges, and more. Our unique hill country topography and relative remote location makes all of these items more expensive than they would be in flatter urban areas. Thus it is hard to compare Kerrville’s finances and operations to these other cities. One fact that Mr. Garcia left off of his ad is Kerrville’s total tax rate compared to these other nine cities. Interestingly, Kerrville’s tax rate is LOWER than six of the other cities on this list. It seems at odds with Mr. Garcia’s conclusions to point out that Kerrville, with the second-highest tax-supported debt total on the list, also has one of the lowest tax rates on the list. Kerrville has not raised the property tax rate for 10 straight years. In fact, in 2010, City Council established a policy that no new tax-supported debt would be issued that would require a tax increase. That policy remains in place to this day. How is this possible? The reason that Kerrville is able to pay off the debt we have without raising taxes is because the majority of the “tax-supported debt” is not actually paid for with property tax revenue. For example, according to the City of Kerrville’s 2018 debt disclosure document, of the approximately $60 million in outstanding debt, more than $30 million is related to water, sewer, and other infrastructure. Those debts are typically paid off using water and sewer revenues (your water bill). Another large portion of the debt is related to the River Trail and Sports Complex, which are bonds that are paid off using 4B sales tax revenues from the EIC — NOT from property taxes. The EIC is paying about $1.1 million per year for the River Trail and Sports complex (about 44% of the total annual debt service for the general fund). However, to get a good rate on that debt, the notes are SECURED using ad valorem property taxes. So even though we don’t use ad valorem taxes to pay off these notes, we do use the taxes we collect as COLLATERAL to secure a better deal. As you can see in the graphs below, the city’s debt service is around $2.5 million annually for the general fund debt and about $4 million per year for the water fund debt. As mentioned above, the EIC pays about $1.1 million per year, and the ad valorem taxes only pay about $1.4 million per year right now. 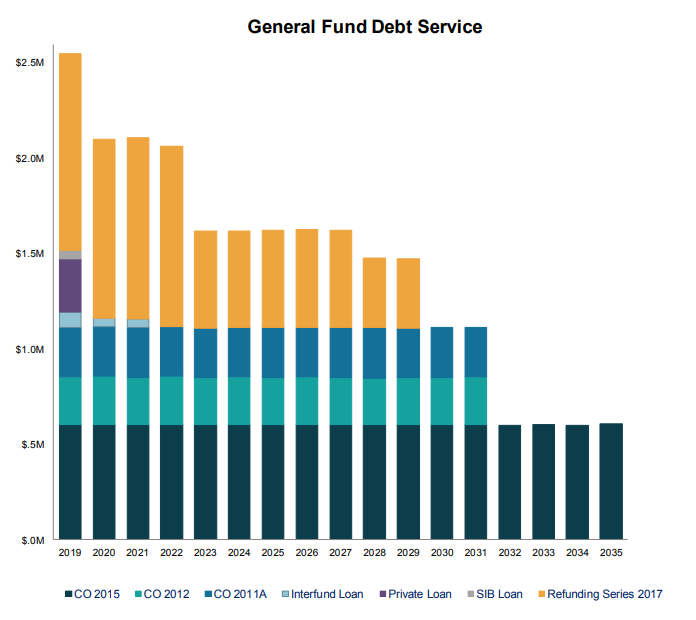 But by 2020, you see our debt service start to fall as some of the loans/bonds are paid off. At this rate, if we don’t incur any new debt, our payments on the general fund debt would be down to about $500,000 by 2032. General fund debt ladder as shown in the 2019 budget book. 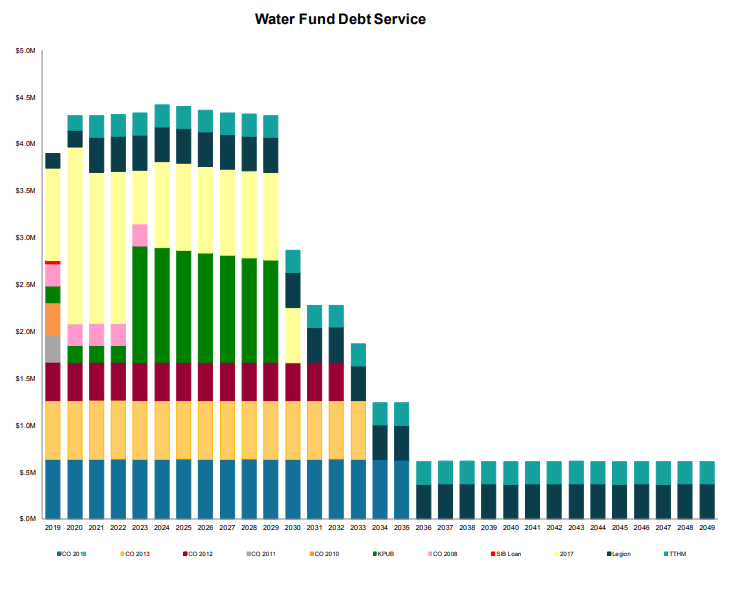 Water and Sewer Fund debt ladder as shown in the 2019 budget book. The Water and Sewer Fund debt is paid for with revenues from your utility bills, but it is also secured by ad valorem taxes so that we can get a good rate on the notes. This is another misleading factor from Garcia’s ad, because this is a large portion of our debt, yet we’re not using our property taxes to pay it off. What’s important to note here is the word “election.” The city is contemplating putting this matter before the voters. Also, importantly, adding new debt to finance a Public Safety Complex for enhanced fire and police protection would be achieved WITHOUT raising taxes. City finances is a very complicated subject. It takes a lot of work to understand the intricacies. But luckily, as a voter and a taxpayer, you’re not expected to be totally fluent in all aspects of city financial statements. What you should know, though, is that Garcia’s numbers don’t add up mathematically, and they’re not a fair representation of the city’s complete financial picture. City Council has a policy that it WILL NOT increase taxes to pay for new debt. This policy has been in place since 2010. The city also has a policy that Water and Sewer Fund debt CANNOT exceed 35% of the fund’s annual revenue. Right now we’re at roughly 31%, so we’re under that conservative benchmark policy. Much of the city’s debt is not actually paid for out of ad valorem (property) taxes, but most of it is SECURED using that tax base so that we can achieve a good interest rate. Right now we pay interest rates as low as 2.25% (Water Development Board subsidized bond) which is VERY LOW. Since a large portion of our debt is NOT paid for by property taxes, the claim that every “man, woman, and child” is on the hook for nearly $3,000 of debt is not valid or helpful. Kerrville’s total debt has increased since 2008, as Garcia claims, and most of that increase is to pay for repair, maintenance, and construction of infrastructure projects like water and sewer facilities. Thanks to the utility bills you pay every month, the city is able to finance and pay off these infrastructure improvements that will help Kerrville continue to grow responsibly AND take care of our current needs. The City of Kerrville passes a balanced budget every single year. For the city’s largest operating funds, expenditures do not exceed revenues. Comparing Texas’s debt to New York’s debt does not seem relevant or important in the least. Invoking “New York values” seems to be purely political theater in this context and does not provide useful information. Any new debt issuance for a public safety complex would be put to a vote, according to the city’s budget documents published in 2018. Garcia’s ad is misleading and does not represent the truth about the city’s complete financial picture. Thanks for reading this very nuanced and complicated article on a very nuanced and complicated subject! Please contact us with any questions you may have. Also, check out this video that we created in 2017 that explains the city’s finances in greater detail. Video created in 2017 explaining the city’s finances. Although the numbers may have changed slightly, the concepts remain true today. This entry was posted in City Council, City of Kerrville, Elections, Kerrville, Local Issues, News and tagged ad valorem, advertisement, city council, city of kerrville, election, fact-check, mario garcia, property tax on April 2, 2019 by Aaron Yates.